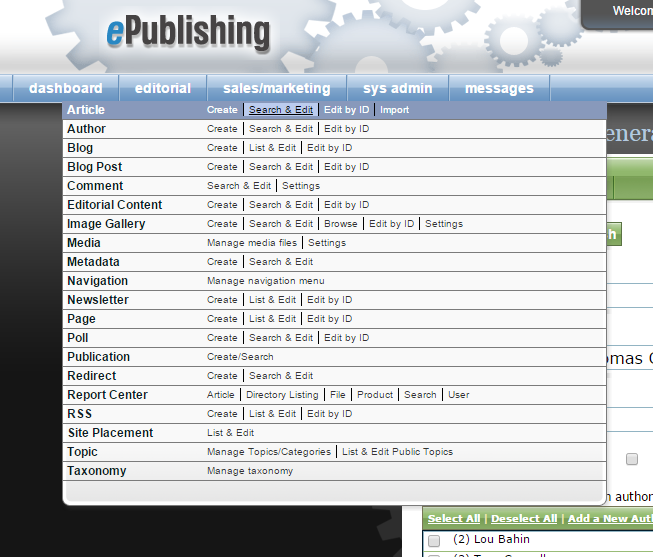 ePublishing Knowledge BaseePublishing Knowledge BaseePublishing Knowledge Base EditorialHow do I duplicate an article? You may find it would be faster and easier to copy an article and update the content than to start from scratch. This article shows you how to duplicate articles. 1. On your dashboard, hover over Editorial and select Search and Edit next to Article. 2. 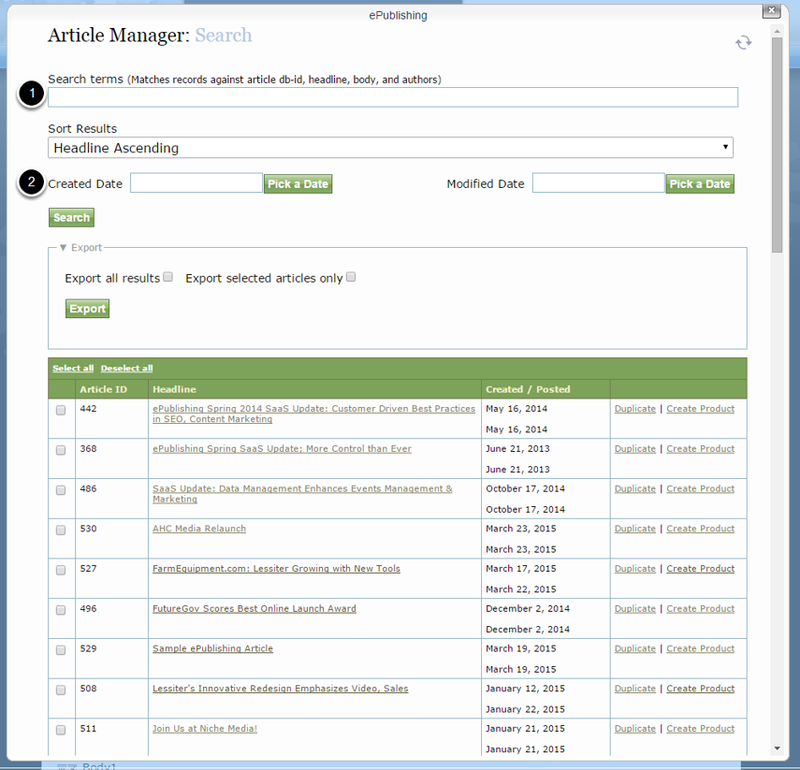 This will open the Article Manager search tool. Zoom: This will open the Article Manager search tool. 3. You may sort the results to simplify your search. Zoom: You may sort the results to simplify your search. Headline Descending/Ascending - This will sort results using the headlines and presenting in alphabetical order either descending (Z to A) or ascending (A to Z). Created Descending/Ascending - This will sort by when the article was created. Descending will show content that was created most recently first. Ascending will show the oldest content first. Post Date Descending/Ascending - This will sort by when the article was published. Descending will show content published most recently first. Ascending will show the oldest content published first. Note: You do not need to enter a search term to sort the results. Simply select one of the above options, and click Search. 4. To duplicate an article, click Duplicate. Zoom: To duplicate an article, click Duplicate. 5. You will be taken to the Article Manager. The article will show as published. If you'd like to unpublish the content (recommended), click Unpublish before starting. Zoom: You will be taken to the Article Manager. The article will show as published. If you'd like to unpublish the content (recommended), click Unpublish before starting. When you are finished updating the article, don't forget to click Publish again. 6. 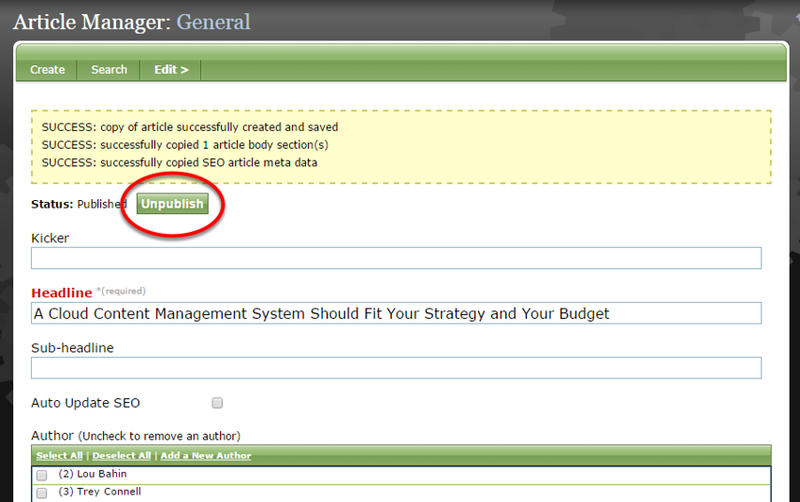 To ensure keywords, description, browser title and URL update as you update the new article, select Auto Update SEO. Zoom: To ensure keywords, description, browser title and URL update as you update the new article, select Auto Update SEO. Learn more about how to use the Article Manager to create and edit content: How do I create an article? Prev: How do I preview an article or blog post before publishing? Next: How do I assign site placement for articles?